Vernon Sounders thinks he was selected as the featured artist for the Wy'east Artisans Guild's latest show because his work is "a bit different." Sounders, who creates acrylic paintings and mixed media pieces, draws much of his inspiration from steampunk culture, a genre of films and novels that combines Victorian-era historical elements, science fiction and steam-powered machinery. One of the reasons Sounders appreciates the culture is that during the time period, the ways in which the world worked were still being discovered. "I like the idea of a lot of adventure at the time, because the world was not completely known," the Eagle Creek-based artist said. "People made assumptions about how the future would run. Some of it was true, some wasn't." Art from Sounders and other guild members will be included in the group's show "Different Strokes," which will be featured at the Sandy Actors Theatre, 17433 Meinig Ave, Sandy. The pieces in "Different Strokes" complement the Sandy Actors Theatre's production of "Rose Colored Glass." Both "Different Strokes" and "Rose Colored Glass" will be featured from Friday, Jan. 26, to Sunday, Feb. 18. "The play dramatically follows two women overcoming their differences and prejudices by finding a common ground," Vern Groff of the Wy'east Artisans Guild wrote in a press release. "Artists look for solutions that have a rightness to it. Different colors, shapes and subjects are brought into harmony." In the show, Sounders has three paintings and one mixed media, steampunk-themed mask. "It's a lot of found object parts. The design was built around an old car respirator," he said, discussing the mask "I used antique phonograph parts as a face piece." He noted that the mask took about two years to assemble. "I took a little bit from here, a little from there and put it all together," he said, explaining that it took awhile to find all of the right parts for the mask. One of Sounders' paintings is a "ghostly self-portrait," using shades of blue and black. "The play is called 'Rose Colored Glass,' and I thought of the idea of putting (rose colored glasses) on and making myself look better," he said. 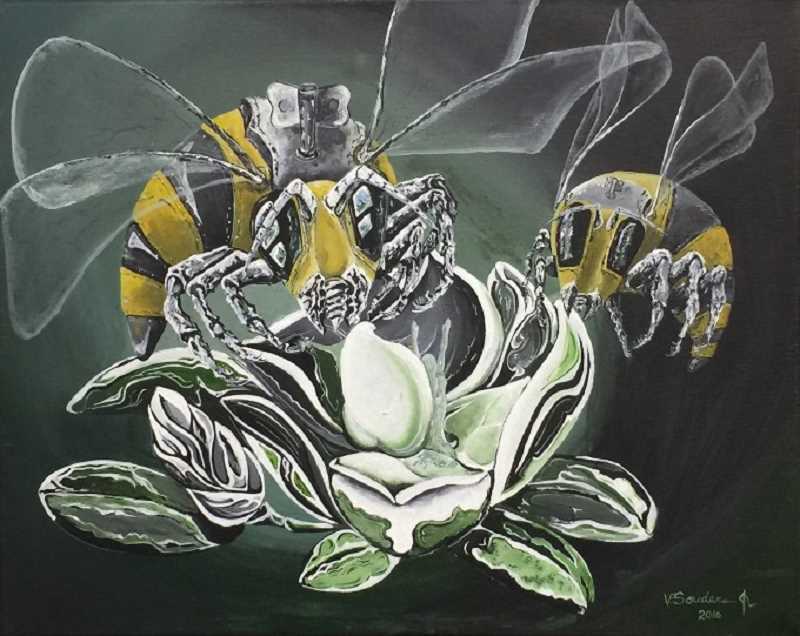 Another painting features mechanical, steampunk-inspired bees floating above a flower. Sounders' interest in how machines work, another facet of steampunk culture, has been a staple in his life for many years. "My father was the chief bridge operator in downtown Portland. I spent afternoons under the Morrison Bridge looking up at the gears," he said. He also appreciates the aesthetic provided by the culture. "I like the Victorian era clothing, long coats and top hats," he said. "I bought my first top hat at 12 and have been wearing them ever since. (Today) I like to dress in costumes and go to events." Sounders sees a correlation between creating art and determining the way that the world's machinery worked, which if often a theme in steampunk-inspired media. "How to make something work fascinates me. You had to be an artist with a concept to create," he said. Sounders has been a member of the Wy'east Artisans Guild for three years. He said that at first, he felt like he needed "to step up" with his art, but then he realized his pieces simply had different characteristics than the others. "My wife said, it's that you're different," he recalled. "It's not good or bad. It's just different."